Champurrado is a chocolate-based drink with corn flour added to thicken it. 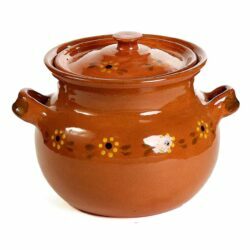 I remember having champurrado on cold winter mornings in my grandmother’s cozy cocina. Grandma always seemed to know what little kids need on any given day, that’s what makes grandmas so special. She made this thick chocolaty drink to help me warm up in the morning. 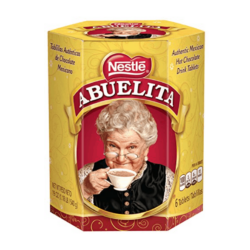 If the champurrado was too hot I remember her pouring it back and forth between two cups to cool it off. 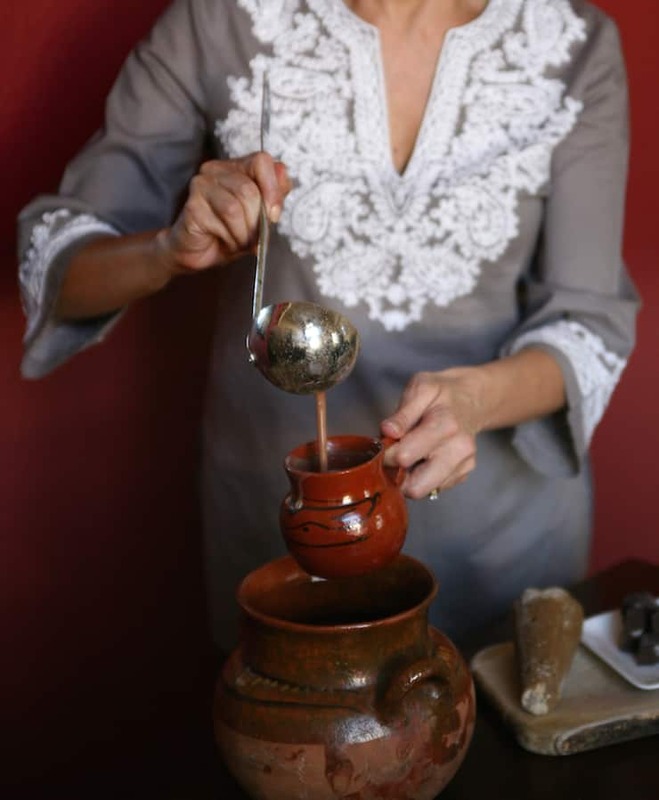 Watch this video to learn how simple it is to make champurrado (chocolate atole). It filled my belly and sometimes it was all I needed for breakfast. As a kid, champurrado reminded me of a thinner version of cream of wheat with a rich and delicious chocolaty taste. 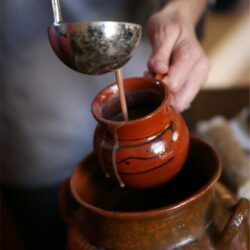 Champurrado is a very popular drink during Dia de los Muertos (Day of the Dead) and Las Posadas during Christmas season. I like the hint of corn after the initial taste of chocolate on my taste buds. In a large saucepan boil water with the two cinnamon sticks and anise star. Remove from the heat, cover and let the cinnamon sticks and anise star steep for about 1 hour. Remove the cinnamon sticks and anise star, return to low heat and slowly add the masa harina to the warm water, whisking until combined. Add milk, chocolate, and piloncillo. Heat over medium heat just until boiling; reduce heat. Simmer, uncovered, about 10 minutes or until chocolate is completely melted and sugar is dissolved, whisking occasionally. 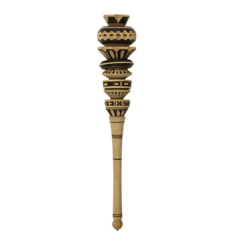 Serve immediately. 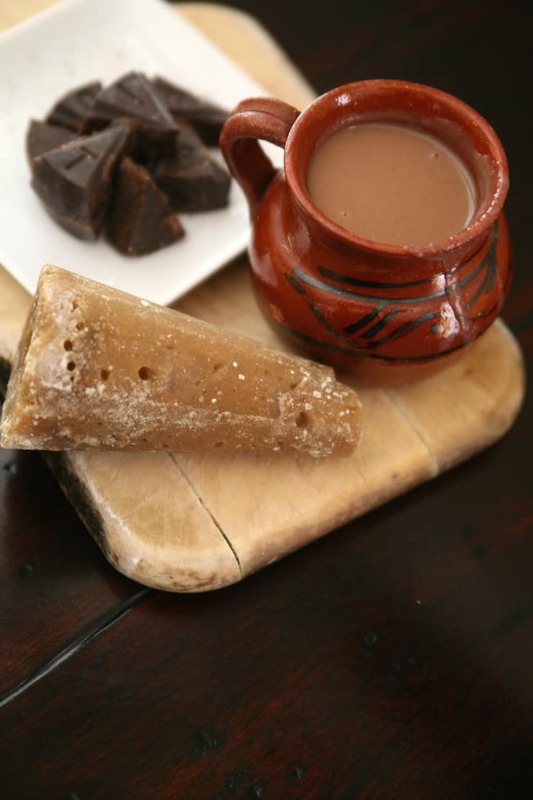 Champurrado is not Mexican Chocolate, it is atole due to the fact that it has masa. My son wanted some champurado after seeing several recepies i tried and my family fell in love with the champurado. Thank you . Best of all it is really easy to make. I cannot find Mexican chocolate in my area. Is there a substitute? I hope you found Mexican chocolate in your area by now. I know you can even purchase Mexican chocolate on Amazon. I have never tried another variety so would not feel comfortable giving a substitute. If you are our of everything, snowed in or live on a ranch away from town like I do, just use what you have! To this syrup, add 1 pint boiling water. stir it for about 4 minutes for the atole to form. add a pint of whole milk and stir some more. I make mine in a 1 quart plastic coffee mug with a snap on lid from Walmart and take it outside with me while I tend my to horses in the morning. If you don’t use boiling water, it will be “grainy” and not an atole and will not have the creamy “mouth feel”. If you do not let it stand hot-mixed long enough before adding the milk, likewise, the atole won’t form. At Christmas, I also crunch up 3 wrapped peppermint round candies and get a “mint chocolate bavarian coffee champurrado”! Lasts me til lunchtime on a regular basis, but then I’m single. Can I use regular flour for this? I wouldn’t reccomend it. I’ve tried it, and the results s were horrible. It really tasted weird and didn’t have an authentic champurrado. 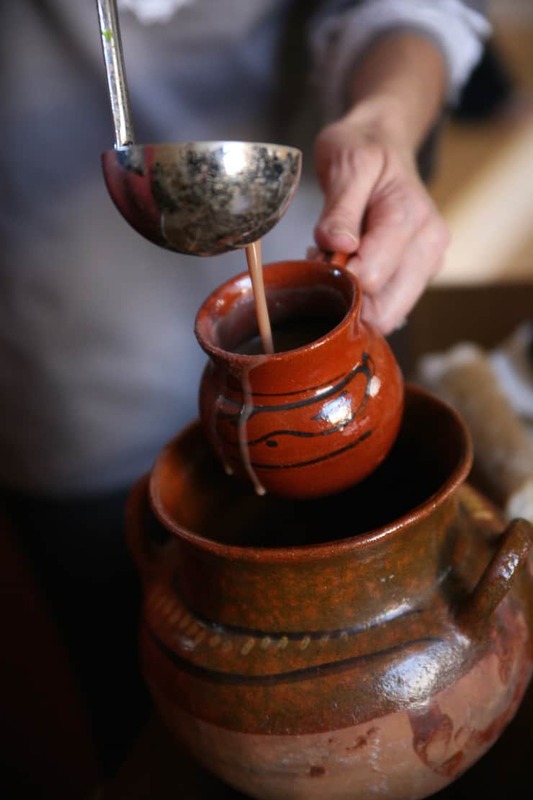 An old historic recipe for champurrado states that “the atole is everything”. Atole is a thin Indian Pudding drink, of starch and water mixed and boiled and flavored. So yes, IF that is all you have til the snow melts, OK! It will have the correct texture but a slightly different flavor until some chocolate and/or spices are added. In Mexico, a special whisk called a molino is twirled between the palms to froth the drink, use a hand held blender for 10-12 seconds to do the same thing. just be sure the starch is premixed with a bit of water before adding boiling water or boiling it all together, or you will have dumplings instead! My old recipe also stated that the Mexican Lancers would carry the dry Atole powdered premixed ingredients in a pouch on the pommel of their saddle, as “Bivouac food”, which they would eat dry if it was all they had, or boil it if they could. Thus, the recipe goes from basic survival food, to ultimate comfort food. Atole is still used as medicine, by Doctors without Borders, to help those recovering from dysentery. The recipe for that is a 2 fingered pinch of salt, a 3 fingered pinch of sugar, just as much corn flour as you can grasp with 4 curled fingers, and a pint of water, mixed then boiled til creamy. 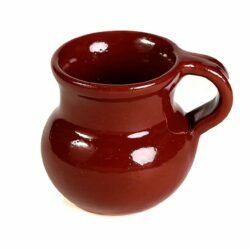 It adds salt, which is lost in dysentery, a bit of sugar for quick energy to a weak body, and the fine hydrated flour in the atole is quickly digestible compared to solid food. It can save a life! I just made this for my kids and I, we loved it! 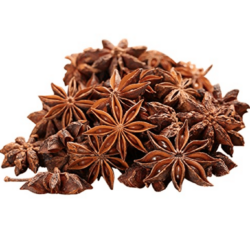 I didnt add the anise because I didnt have any at home. Thank you for sharing! So happy to hear that Miriam! 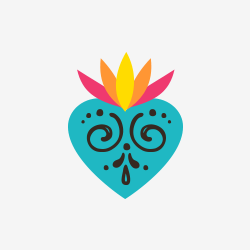 i would love to paint photo of pour Mexican chocolate. Do you know how I can get permission ? From a fellow El Pasoan, this recipe reminds me of my grandma’s champurrado. I’m glad to have found this recipe. Thank you! 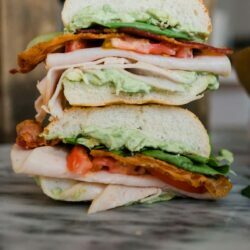 I’m trying to make this for my Spanish class, however will have to make it the night before. Any tips for overnight storage and next day heating process so we can have the best taste? I was thinking about putting it in a slow-cooker the next morning so it will be hot to serve the students! Your Spanish class will love this recipe Kelsey! Yes, feel free to make the night before and reheat on warm in the slow cooker in class. Be sure to stir frequently/before serving. Enjoy! Keep me posted. 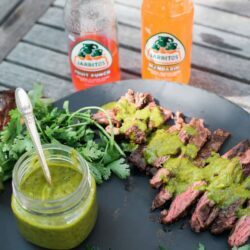 I’ve wanted to make this for friends and family, (fiance’s part mexican but never gets a connection to that part of his family). I’m wondering if there is a way to do this in a crock pot. Or would that be better for keeping it warm after it’s made? Hi Rebecca, I have not made it in the crockpot, but I have kept it warm in the crockpot. Just be sure to stir often and store before serving. Enjoy! I’d like to make this for my son’s Dia de Los Muertos party. 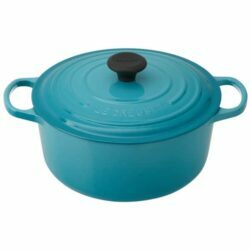 Is there any way to make this in advance and keep it warm in a slow cooker or electric coffee urn? 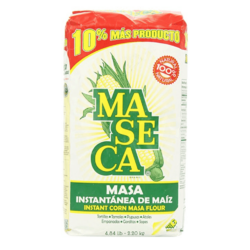 My grandmother never used masa harina. She used AP flour that is toasted until lightly brown in a dry pan. I have made it with only flour because otherwise, I consider it atole. 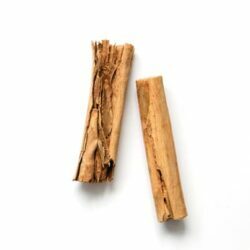 How do I figure how much is 3 ounces of piloncillo? I love champurrado and I want to makes this right away. Please help. 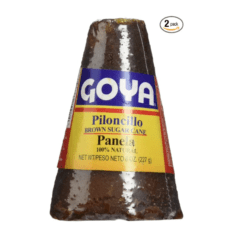 Is panocha the same as piloncillo?